So much has happened over the last couple months on this food blogging journey. First, I'm proud to say I made it as a finalist in the 5th Annual Shorty Awards and will be headed to New York City on April 8th for the ceremony. Fingers crossed that I leave with the 2013 #Food Shorty Award! My Twitter timeline was awesome in rallying up support to get me there and I can't wait to celebrate in Times Square, very exciting! In other news, I was recently featured by PBS in an article discussing the representation of black chefs in the food industry. I'm incredibly honored to be included among some people I truly respect and admire. You can find the article and my interview at PBS' Black Culture Connection. 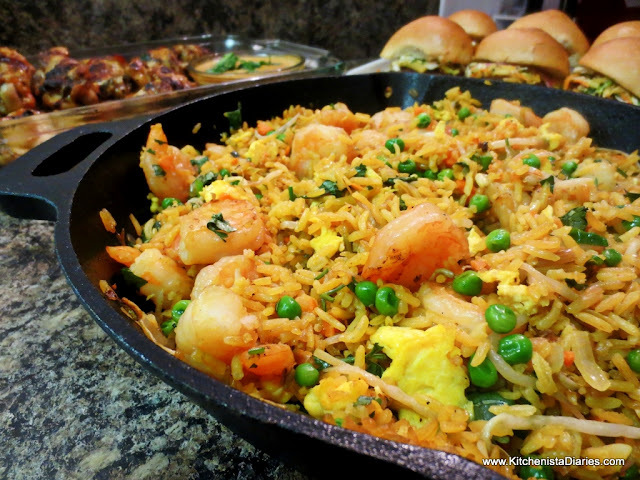 On the home front, I am still keeping busy cooking daily which seems to be the only relief from an incredibly stressful few months at work and in my personal life. 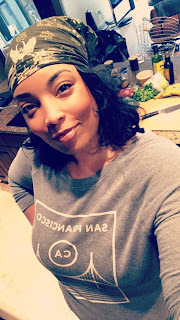 I can't say I've been coming up with the healthiest dishes - your body's natural reaction to stress is to crave comfort foods - but I'm committed to get back in my clean eating groove this spring. 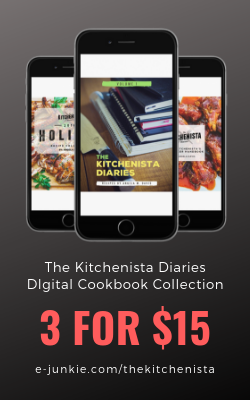 I'm also working on putting together my first collection of special recipes to feature in a upcoming e-cookbook, so for now I'll be pulling some favorites from my vault to blog that I'm sure my readers will love. Bacon, Fennel & Apple Dressing was a dish that I made at home in Virginia this Christmas, and after watching a hilariously tragic cooking tutorial on making cornbread stuffing last night, I decided to share it. 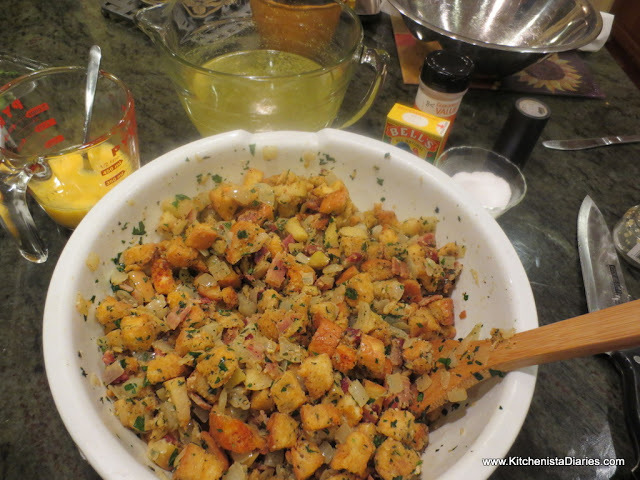 My Bacon, Fennel & Apple Dressing was a modified version of the Linquica Stuffing I made for Thanksgiving...and if you recall, the reason I damn near lost a thumb! If you grew up thinking dressing was bland, dense and an ordinary supporting role on your holiday plates, think again. Much like any other home cooking, dressing from a box is just...not worth your time. It's really never that good, but you can put enough pork sausage in it and smother it with gravy to trick yourself into believe it is. But why do that when you can cook a dressing that's delicious enough to stand on its own? Use fresh bread and quality ingredients and you will be amazed at the difference. Even my dad was surprised by this one, and he's hard to impress. 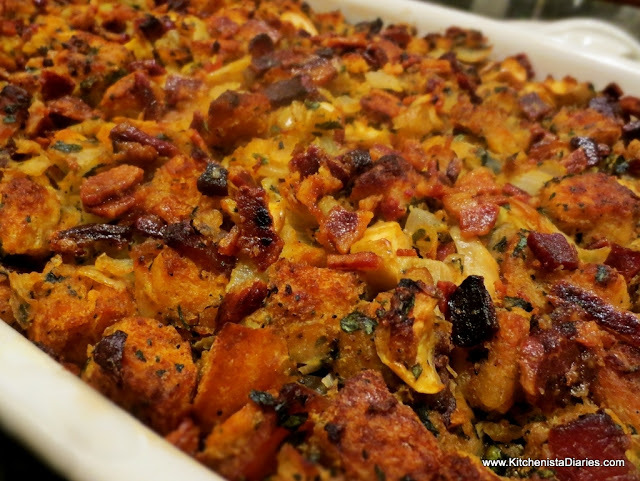 It's rich in flavor with warm paprika and herb notes, definitively bacon-y yet the texture is light, fluffy and moist inside with a crusty top. Throw away the box and make your family some proper dressing for your next holiday gathering. 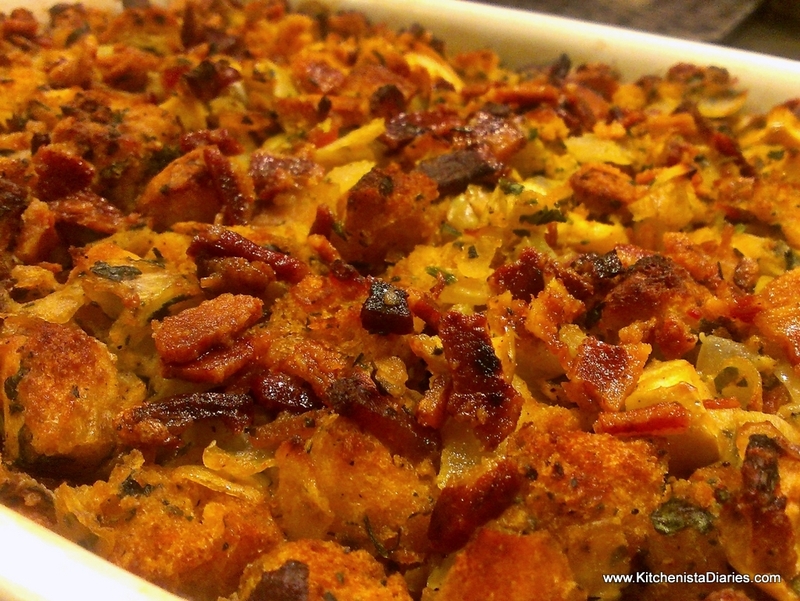 Servings: This makes enough to fill a huge casserole dish and comfortably served a party of 8 with leftovers. Try to get the best quality bacon possible when making a recipe that the bacon is used prominently. 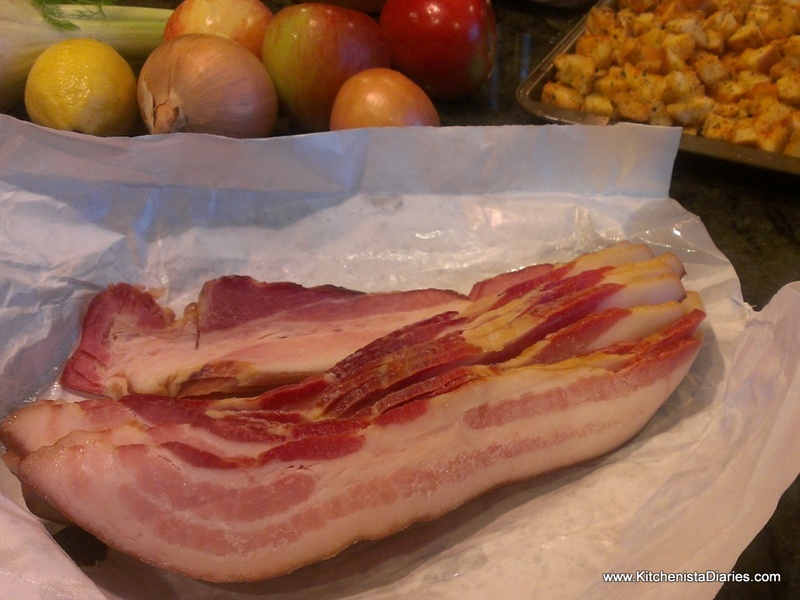 This is thick cut country bacon which has a lovely bite to it in the finished dressing. Bonus, the rind is delicious when stripped and crisped up in the oven. I cooked my bacon on a baking sheet starting out in a cold oven, turning the heat up to 425°. I reserved approximately 1/4 c. bacon fat. After it was crisp, I removed from the oven and drained it on paper towels and then crumbled it. 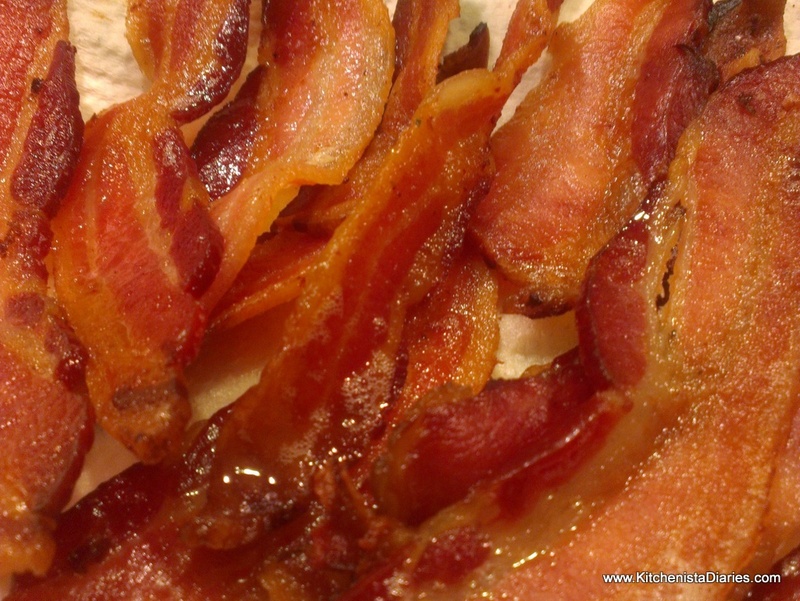 You could dice up your bacon and cook it in the skillet instead, which is actually how I usually do it. This stuff was extra thick though so I thought the oven would do it justice. Mmmm....bacon. The best bread to use for dressing is slightly stale. It will soak up more of the broth and flavors of the vegetables as opposed to using moist fresh bread. If your grocery store sells day old French or Italian bread, that's a great way to get it on the cheap. 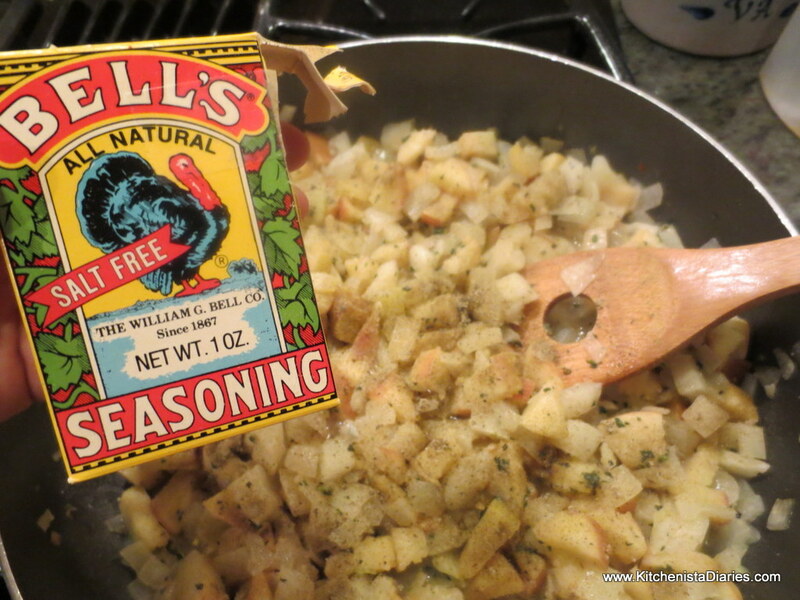 I like to pump extra flavor in my stuffing by seasoning and toasting my bread cubes first. I laid out the cubes on a large baking sheet, drizzled in olive oil and then dusted with the smoked paprika, about a teaspoon of Bell's Poultry Seasoning, and the garlic powder. Toast that in an oven on low heat (about 300°) until golden brown. 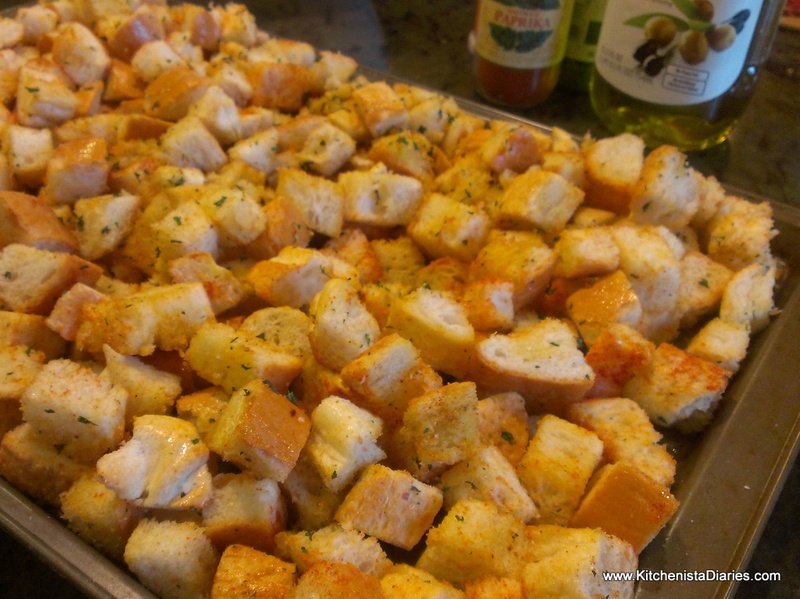 Try not to eat them, because essentially you just made croutons! In your skillet, add a couple tablespoons of bacon fat and two tablespoons of butter, over medium heat. 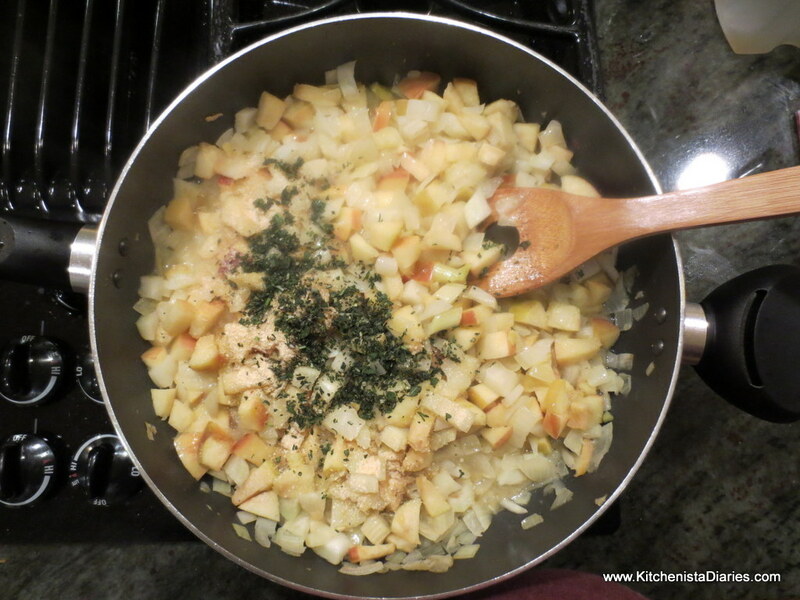 Add the diced onions, fennel, and garlic. Cook until translucent, 3 - 4 minutes. Season with a pinch of salt. 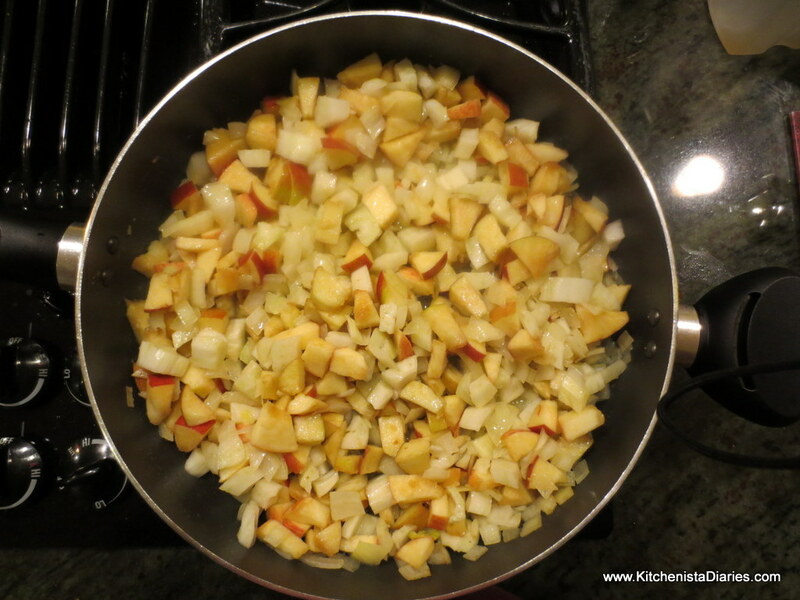 Add the diced apples and continue to cook another 5 minutes until apples have softened. By the way, as long as you thoroughly clean them (and hopefully bought organic), there's really no need to peel the apples. Season the apples, onion and fennel with the lemon juice, chopped herbs, black pepper, and a couple pinches of salt. I added a teaspoon or so of Bell's Seasoning too. This stuff is money. My dad put me on years ago but it had been forever since I'd cooked with it. 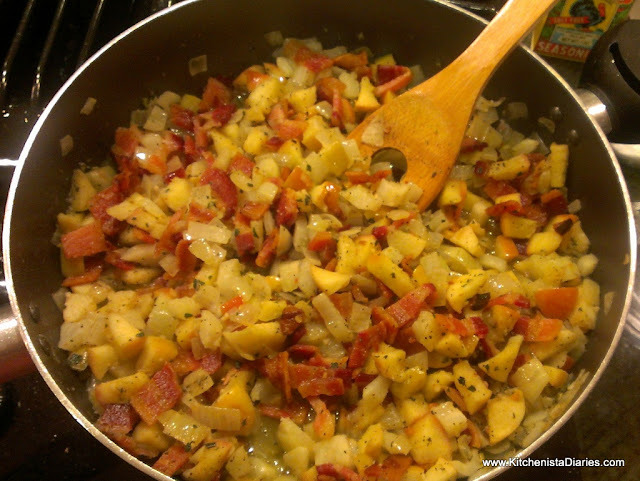 Add half of the crumbled bacon to the apples and stir to incorporate. Turn off the heat. 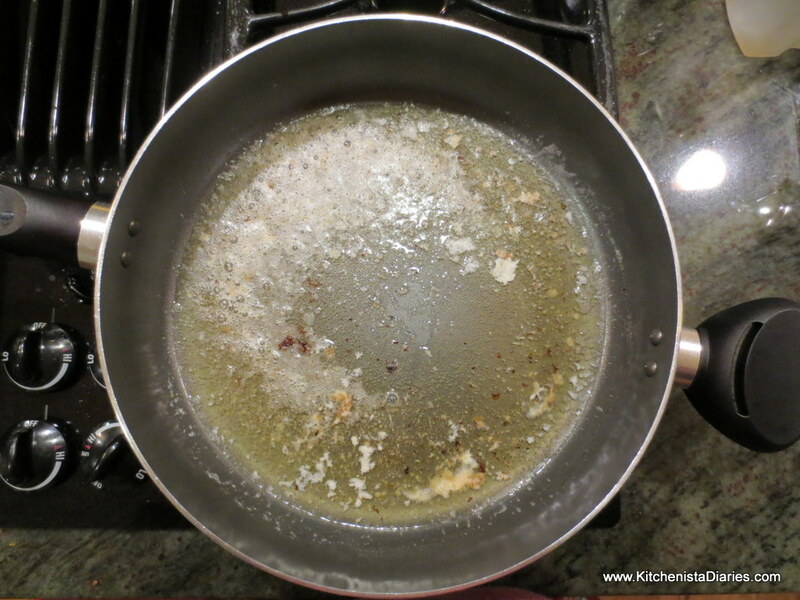 Transfer the toasted bread cubes to a large bowl, add the cooked ingredients from the skillet, and toss gently. This is where things rely on instinct. 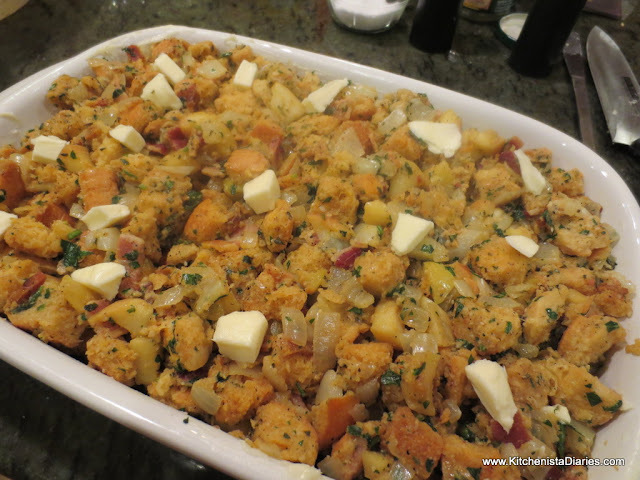 You want to add just enough stock to moisten the bread cubes, but not enough to turn them into mush. Add a couple cups, toss to incorporate, and then slowly pour in a little bit at a time until you get to the right consistency. 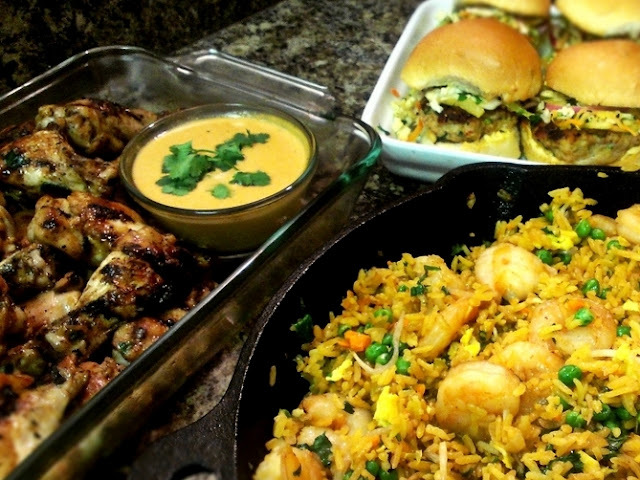 Use your hands and learn to "feel" as you cook. 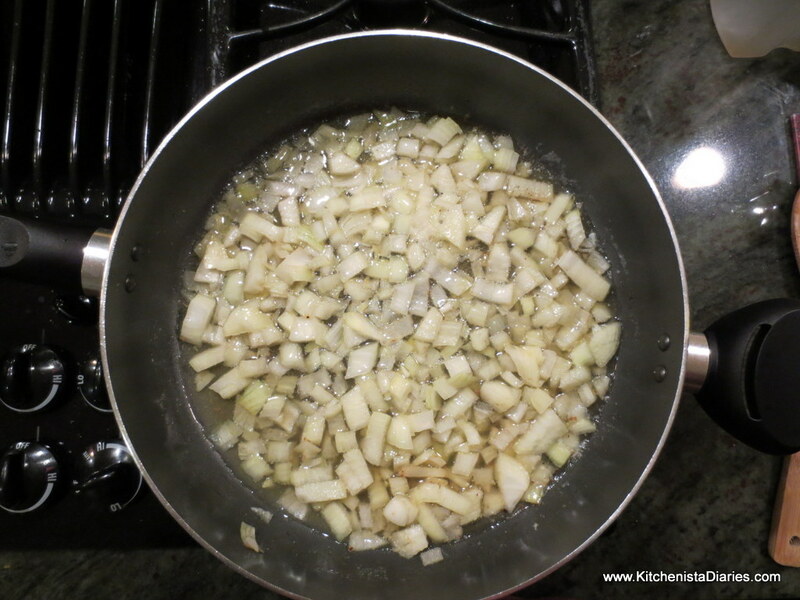 Season to taste if needed with a pinch of salt, garlic powder, Bell's, etc. Finally, stir in the beaten eggs. Gently press the dressing into a large buttered casserole dish. Dot with the remaining butter. Bake on the center rack of a preheated oven, 350°, until the top is toasted and golden brown, 30 to 40 minutes.